I have been trying to include more fish and chicken in our diet. It took a while for us to get used to the smelly fish – salmon. Since this is one of the healthiest fishes available in the market here, I try to make something with it atleast once a week. Recently I tried 2 types of kababs with them. I think they looked kinda cool. So Ishaan was ready to try these. 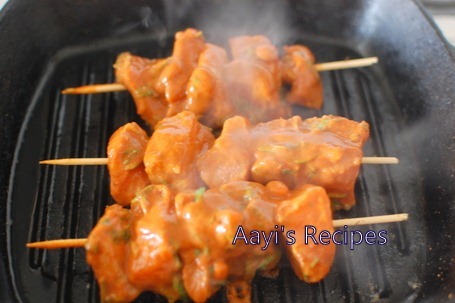 The pieces get marinated very well as they are cut into small pieces. Apply the marinade to salmon pieces. Add the coriander leaves. Leave it aside for atleast 2hrs. Arrange the pieces on skewers. Grill them till done. I use my cast iron grill pan for grilling. Serve hot with lemon. 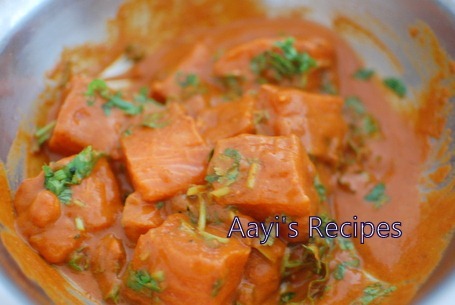 Serve it as a starter or as a main dish with some rice and a simple dal. Yummy dish…:-) while grilling fish on cast iron pan have you used oil?? Hmmm! Hunks of raw salmon! 🙂 Those look absolutely delish! looks yummy!! thanks for d recipe. is salmon fish visonu or surmai? Instead of grilling, can I bake it? If so, what temperature and how long? Any other ways to cook this instead of grilling? You could shallow fry them on tava. I haven’t tried baking. 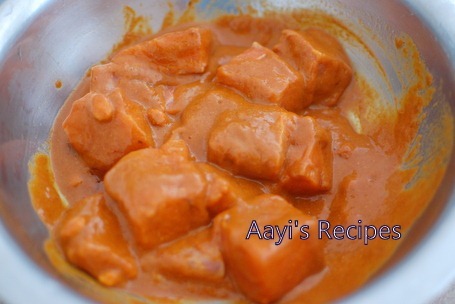 I generally make this way instead of yogurt u can use olive oil and no need to use oil for frying this taste v good. 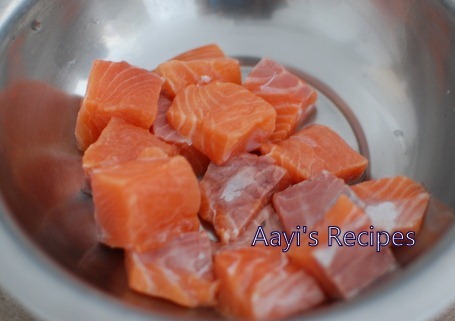 can anyone suggest where can i get salmon in delhi……… or any indian fish which is close to salmon in taste & texture….. I don’t have a grill. Can I bake in oven? Norwegian Salon is rarely found in Mumbai. 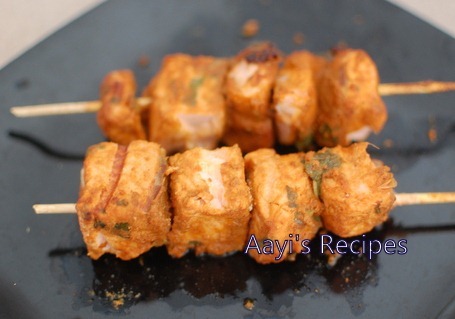 Got it today & tried your recipe “Spicy Salmon Kababs”!!! It was an absolute delight & very yummy, my husband was happy as I definitely did justice to the salmon! Thanks a lot, Shilpa! Salmon’s Indian (Hindi/Marathi) name is Rawas.